• 300-400mm – Width for Box Gutters and extra wide gutters. • 1mm square UVR treated fibreglass screen. • All weather adhesive tapes. • Keeps leaves, vermin, birds out. • Guaranteed for three years. Are you saying “I CAN DO THAT” ? 1. Advise your name and address. 2. The number of metres required. 3. The type of roof. Your order will be delivered to your door by Australia Post with a 3 Year Guarantee and easy to follow instructions. Just imagine – no more climbing ladders to clean your gutters! 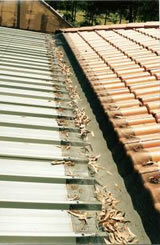 At last, a gutter protection product that actually works! 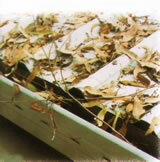 The system that eliminates leaves, debris and twigs from your gutter system. Leaves flow over your gutter and NOT into them. With our System installed, leaves, twigs and debris are filtered out instead of entering the gutters. Debris tends to block water flow, leaving pockets of brackish water – the perfect breeding ground for mosquitos! In the event of a bushfire…. It is comforting to know that your gutters are free of inflammable rubbish.